This article is about the Italian river. For other uses, see Tiber (disambiguation). The Tiber (/ˈtaɪbər/; Latin: Tiberis; Italian: Tevere [ˈteːvere]) is the third-longest river in Italy, rising in the Apennine Mountains in Emilia-Romagna and flowing 406 kilometres (252 mi) through Tuscany, Umbria and Lazio, where it is joined by the river Aniene, to the Tyrrhenian Sea, between Ostia and Fiumicino. It drains a basin estimated at 17,375 square kilometres (6,709 sq mi). The river has achieved lasting fame as the main watercourse of the city of Rome, founded on its eastern banks. The river rises at Mount Fumaiolo in central Italy and flows in a generally southerly direction past Perugia and Rome to meet the sea at Ostia. Popularly called flavus ("the blond"), in reference to the yellowish colour of its water, the Tiber has heavily advanced at the mouth by about 3 kilometres (2 miles) since Roman times, leaving the ancient port of Ostia Antica 6 kilometres (4 miles) inland. However, it does not form a proportional delta, owing to a strong north-flowing sea current close to the shore, to the steep shelving of the coast, and to slow tectonic subsidence. The source of the Tiber consists of two springs 10 metres (33 ft) away from each other on Mount Fumaiolo. These springs are called "Le Vene". The springs are in a beech forest 1,268 metres (4,160 ft) above sea level. During the 1930s, Benito Mussolini placed an antique marble Roman column at the point where the river arises, inscribed QUI NASCE IL FIUME SACRO AI DESTINI DI ROMA ("Here is born the river / sacred to the destinies of Rome"). There is an eagle on the top of this column. The first miles of the Tiber run through Valtiberina before entering Umbria. It is probable that the genesis of the name Tiber was pre-Latin, like the Roman name of Tibur (modern Tivoli), and may be specifically Italic in origin. 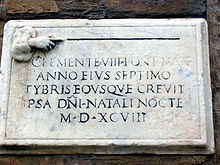 The same root is found in the Latin praenomen Tiberius. There are also Etruscan variants of this praenomen in Thefarie (borrowed from Faliscan *Tiferios, lit. '(He) from the Tiber' < *Tiferis 'Tiber') and Teperie (via the Latin hydronym Tiber). The legendary king Tiberinus, ninth in the king-list of Alba Longa, was said to have drowned in the river Albula, which was afterward called Tiberis. The myth may have explained a memory of an earlier, perhaps pre-Indo-European name for the river, "white" (alba) with sediment, or "from the mountains" from pre-Indo-European word "alba, albion" mount, elevated area. Tiberis/Tifernus may be a pre-Indo-European substrate word related to Aegean tifos "still water", Greek phytonym τύφη a kind of swamp and river bank weed (Typha angustifolia), Iberian hydronyms Tibilis, Tebro and Numidian Aquae Tibilitanae. Yet another etymology is from *dubri-, water, considered by Alessio as Sicel, whence the form Θύβρις later Tiberis. This root *dubri- is widespread in Western Europe e.g. Dover, Portus Dubris. According to the legend, Jupiter made him a god and guardian spirit of the river (also called Volturnus, "rolling water"). 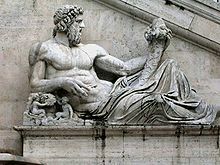 This gave rise to the standard Roman depiction of the river as a powerfully built reclining god, also named Tiberinus, with streams of water flowing from his hair and beard. The Tiber was also believed to be the river into which Romulus and Remus (the former founded Rome) were thrown as infants. According to legend, the city of Rome was founded in 753 BC on the banks of the Tiber about 25 kilometres (16 mi) from the sea at Ostia. The island Isola Tiberina in the centre of Rome, between Trastevere and the ancient center, was the site of an important ancient ford and was later bridged. Legend says Rome's founders, the twin brothers Romulus and Remus, were abandoned on its waters, where they were rescued by the she-wolf, Lupa. 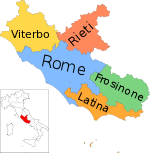 The river marked the boundary between the lands of the Etruscans to the west, the Sabines to the east and the Latins to the south. Benito Mussolini, born in Romagna, adjusted the boundary between Tuscany and Emilia-Romagna, so that the springs of the Tiber would lie in Romagna. The Tiber was critically important to Roman trade and commerce, as ships could reach as far as 100 kilometres (60 mi) upriver; there is evidence that it was used to ship grain from the Val Teverina as long ago as the 5th century BC. It was later used to ship stone, timber and foodstuffs to Rome. During the Punic Wars of the 3rd century BC, the harbour at Ostia became a key naval base. It later became Rome's most important port, where wheat, olive oil, and wine were imported from Rome's colonies around the Mediterranean. Wharves were also built along the riverside in Rome itself, lining the riverbanks around the Campus Martius area. The Romans connected the river with a sewer system (the Cloaca Maxima) and with an underground network of tunnels and other channels, to bring its water into the middle of the city. Wealthy Romans had garden-parks or "horti" on the banks of the river in Rome up through the first century BC. These may have been sold and developed about a century later. The heavy sedimentation of the river made it difficult to maintain Ostia, prompting the emperors Claudius and Trajan to establish a new port on the Fiumicino in the 1st century AD. They built a new road, the via Portuensis, to connect Rome with Fiumicino, leaving the city by Porta Portese ('the port gate'). Both ports were eventually abandoned due to silting. Several popes attempted to improve navigation on the Tiber in the 17th and 18th century, with extensive dredging continuing into the 19th century. Trade was boosted for a while but by the 20th century silting had resulted in the river only being navigable as far as Rome itself. The Tiber was once known for its floods — the Campus Martius is a flood plain and would regularly flood to a depth of 2 metres (6 ft 7 in). The river is now confined between high stone embankments which were begun in 1876. Within the city, the riverbanks are lined by boulevards known as lungoteveri, streets "along the Tiber". 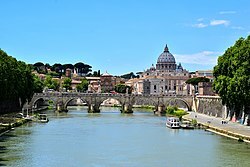 Because the river is identified with Rome, the terms "swimming the Tiber" or "crossing the Tiber" have come to be the Protestant shorthand term for converting to Roman Catholicism. This is most common if the person who converts had been Anglican, the reverse of which is referred to as "swimming the Thames" or "crossing the Thames". In ancient Rome, executed criminals were thrown into the Tiber. People executed at the Gemonian stairs were thrown in the Tiber during the later part of the reign of the emperor Tiberius. This practice continued over the centuries. For example, the corpse of Pope Formosus was thrown into the Tiber after the infamous Cadaver Synod held in 897. Rome Fiumicino airport is also located near the river. In addition to the numerous modern bridges over the Tiber in Rome, there remain a few ancient bridges (now mostly pedestrian-only) that have survived in part (e.g., the Ponte Milvio and the Ponte Sant'Angelo) or in whole (Fabricius' Bridge). In addition to bridges, there are tunnels which the Metro trains use. ^ Richard J. A. Talbert, ed. (2000). Barrington Atlas of the Greek and Roman World: Map-By-Map Directory. I. Princeton, NJ and Oxford, UK: Princeton University Press. p. 630. ISBN 0691049459. ^ "Tiber". World Encyclopedia. Philip's, 2005. ^ "Tiber Springs – Mount Fumaiolo". turismo.fc.it. Archived from the original on 27 September 2013. Retrieved 23 February 2019. ^ "Tuscany tours – the origin of the Tiber River". Farm Holidays Le Ceregne. Archived from the original on 11 May 2010. Retrieved 23 February 2019. ^ a b "Tiber". Concise Dictionary of World Place-Names. John Everett-Heath. Oxford University Press 2005. ^ Cf. e.g. G. Alessio "Studi storico-linguisitci messapici" in Archivio Storico Pugliese p. 304; "Sul nome di Brindisi" in Archivio Storico Puglese VIII 1955 p. 211 f.; "Apulia et Calabria nel quadro della toponomastica mediterranea" in Atti del VII Congresso Internazionale di Studi Onomastici Firenze 1962 p. 85. ^ G. Simonetta "La stratificazione linguistica dell' Agro Falisco" p. 6 citing G. Alessio. ^ G. Alessio "Problemi storico-linguistici messapici" in Studi Salentini12 1962 p. 304. ^ Moore, Malcolm (21 November 2007). "The legend of Romulus and Remus". Telegrpah. Telegraph Media Group Limited. Retrieved 23 February 2019. This page was last edited on 4 March 2019, at 10:35 (UTC).